The systematic approach from our previous two columns worked on the premise that any melodic bend should connect two adjacent notes of a scale. In practice, most of the bends you hear in conventional playing (microtonal inflections excepted) will indeed prove to be consistent with this theory. But rules are made to be broken and you can expand your vocabulary considerably by attempting to connect non-adjacent scale tones within a single bending motion. The accompanying video lesson is predominantly based around the E Dorian mode, which means that the 'right' notes are E, F#, G, A, B, C# and D.
Above is a neck diagram (Ex1) illustrating where to find all the possible instances of those notes. Let's start with a little trick that should look and sound familiar to most readers. Ex2 illustrates the concept of the unison bend - a very popular device among the blues/rock contingent! Essentially, you're playing the same pitch on two adjacent strings, but while one string remains static, the other bends up to the target note from a tone below: you can hear the two pitches 'fighting' each other as their pitches are about to converge, creating a 'screaming' effect, which sounds thicker and more powerful than any single-string rendition of the same note. The first four notes of Ex4 basically outline the opening motif from Frère Jacques, and they're all played at the 15th fret. You could describe this as a 'stepped' bend: the pitch is bent up a tone and then rests there before continuing the journey up to its next destination, two whole tones above its starting position, and finally returning to its original unbent pitch. It's important to pause at that mid-point during the upward bend, so the listener perceives a distinct melodic event halfway between the D and the F#, rather than simply hearing a single wide bend: you might even choose to release your bend slightly after visiting the E note but before continuing to push all the way up to F#, to create more of a 'swooping' effect as you approach the highest note of the phrase. For the full Another Brick In The Wall effect, you might even try to incorporate a G note after that whole D-E-F# movement… it'll only hurt slightly more! Ex4 illustrates how to apply this idea diatonically all along a single string, starting on each note in turn from the D major/E Dorian pool of notes shown in Ex.1. Needless to say, the same principle applies to any other seven-note scale you can think of… and indeed to any other string (though you should perhaps exercise caution when trying this on the highest string: if there's any finer way to break a top E string, I have yet to encounter it!). Weirdly enough, the above example becomes much more challenging if you attempt to revisit the 'mid-point' pitch on the way down, during the release of your big bend. Executing that fourth note in Ex5 might feel confusing at first: at that point, your wrist is aiming to release the bend down to the halfway point, but your fingers still think they're bending the string upwards! As is so often the case, perseverance is the key here: aim to use a twisting wrist motion to determine the actual degree of string bend at any given point, while allowing your fingers to lock in position and focus on simply maintaining their grip on the string. Now, let's make things even harder! Ex6 is essentially the same as its predecessor, but with one major difference: now we're trying to disguise the bends altogether, and make all of the notes sound like they're being fretted conventionally. In a sense, monitoring the pitching in Ex5 probably felt rather like singing, in the sense that the amount of force you were applying to the bent string could be fine-tuned in response to what you were hearing. Ex6, in contrast, is more of a test for your muscle memory: your goal is to make each pre-bent pitch sound 'in tune', using the pick to silence the string whenever it's actually being bent from one pitch to the next. Ex7 introduces the chromatic scale, the one which features all 12 notes, so all the most basic melodic bends are a mere semitone wide. Ex.7 suggests an incremental approach, adding one additional target pitch in each bar. 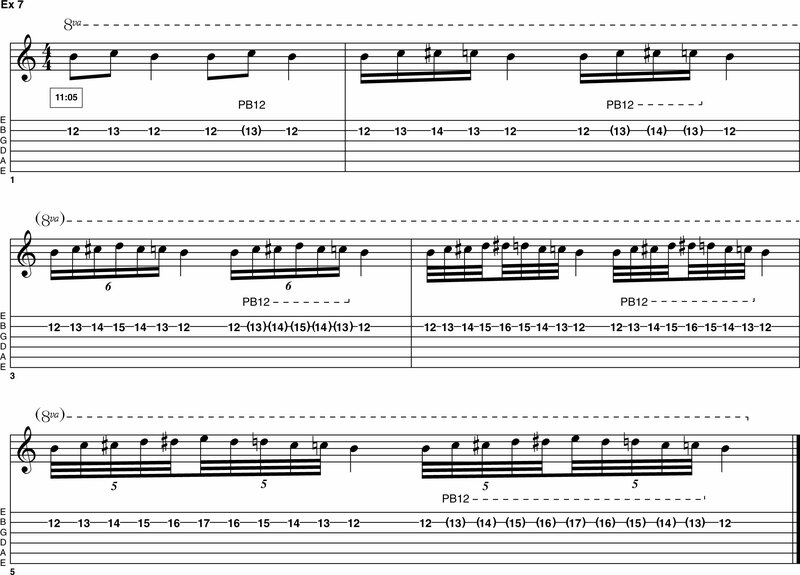 Just to round things off for this time, Ex8 is an excerpt from one of the improvised demonstration licks in the video lesson and it illustrates how you might apply some of those Ex7 chromatic bending ideas in a 'real‑life' situation. Hopefully, you'll be able to come up with all kinds of stuff like this if you've gained some familiarity with all the bending approaches and variations we've covered over the last three months!